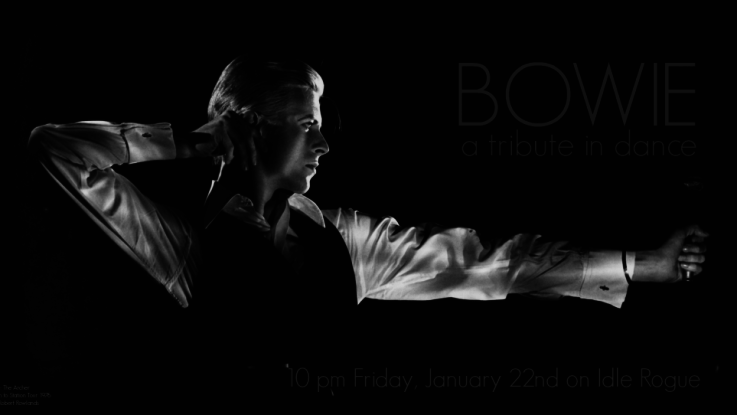 Guerilla Burlesque and invited performers presented a show entirely dedicated to the work of the iconic David Bowie at the Acuo Theatre on Friday, January 22nd. Nine performances were presented works inspired by the man and his music. Some were acts previously presented, most were newly made as a tribute inspired by Bowie’s unexpected death on January 10th. This was a wonderful show, warm and inclusive, and a truly shared experience for all present. The theatre filled within ten minutes of doors opening, with many dedicated Bowie fans gathering together to enjoy the music and the like-minded company. Audiences responded to beloved songs and the visions they inspired for the dances, and there was a true sense of community and love as we all shared our admiration and respect for Bowie’s tremendous body of work. The dancers themselves approached the mission with a reverent ambition. The performances were never sombre, but all were coloured by the same pathos fans across the world have expressed as we collectively analyse our mourning. There was art and beauty, diversity and intrigue, humour and joy and we all felt a sense of belonging with each other and with Bowie himself. Over four hours of music performed and/or written by Bowie provided another community experience, and throughout the performance people remarked on their favourite tunes and the memories they had of them. Many thanks to the performers, and additionally to the PR team (Aubreya Joszpe, Franney, and Fifi) and to Arrehn Oberlander for technical support. Special thanks to Fifi for help acquiring rarer musical pieces. Photos of the performances are available on Guerilla Burlesque’s Facebook page. If you were at the show and have photos of acts or audience that you would like to share, please email idlerogueatgmaildotcom and we will post them on the web. We are aware that many who wanted to see the show weren’t able to get onto the sim, and we’re working on scheduling another performance of the show if there is sufficient interest. As always, members of the Idle Rogue and Guerilla Burlesque Exclusive inworld groups, or supporters of the facebook pages will receive information first.